The job candidate is ready to transition into a managerial position in the freight and carrier sales field. The resume title reflects her future career goal. An Areas of Expertise section contains keywords appropriate to her experience and ranking high in employer applicant tracking systems. 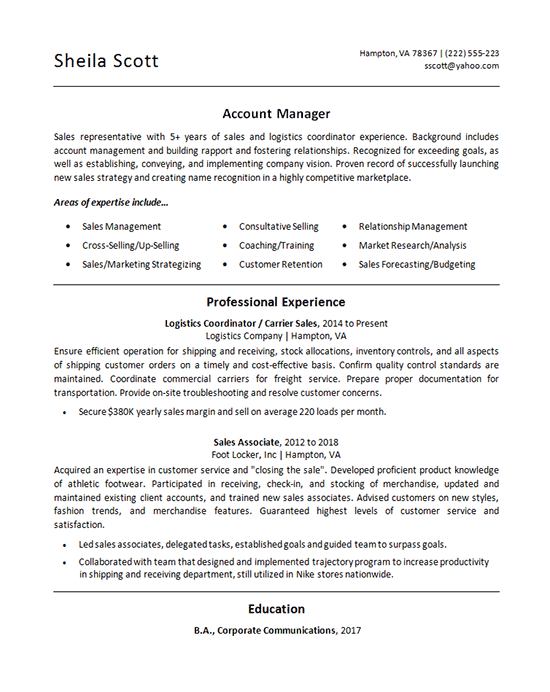 The professional experience details her logistics and sales responsibilities. The writer highlight her relevant accomplishments with bullet points. The accomplishments convey her sales achievements and leadership ability and concluding with her education. Sales representative with 5+ years of sales and logistics coordinator experience. Background includes account management and building rapport and fostering relationships. Recognized for exceeding goals, as well as establishing, conveying, and implementing company vision. Proven record of successfully launching new sales strategy and creating name recognition in a highly competitive marketplace. Ensure efficient operation for shipping and receiving, stock allocations, inventory controls, and all aspects of shipping customer orders on a timely and cost-effective basis. Confirm quality control standards are maintained. Coordinate commercial carriers for freight service. Prepare proper documentation for transportation. Provide on-site troubleshooting and resolve customer concerns.